In my personal mission to taste each and every bourbon on the market today, I must admit that some bourbons are much (much!) harder to drink than others. 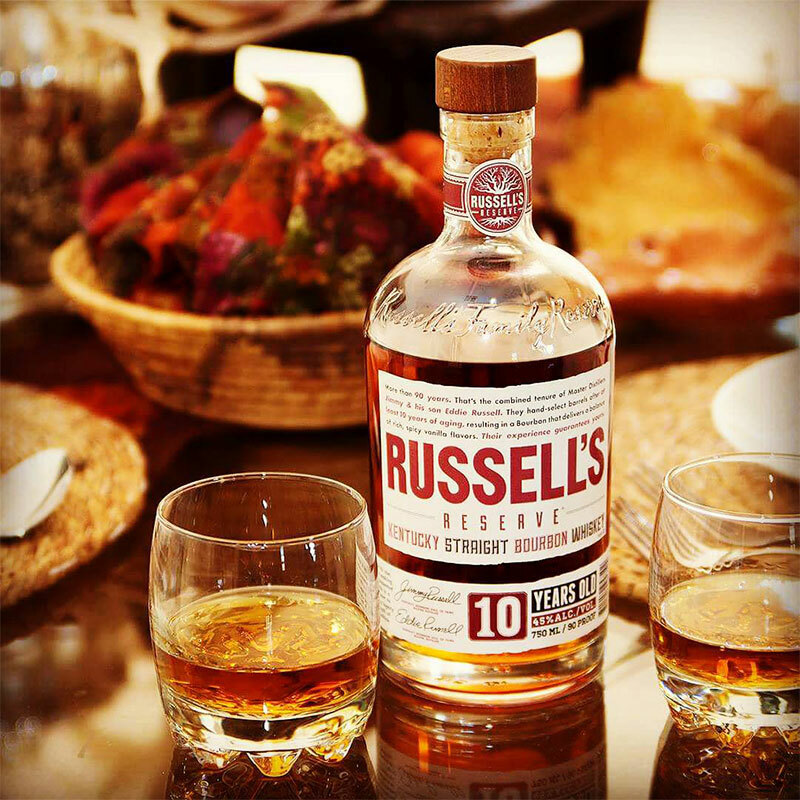 Russell’s Reserve 10 Year Old is a Wild Turkey product from the legendary 3rd Generation Master Distiller Jimmy Russell, and Wild Turkey is not my friend. Naturally, I leered at the bottle with apprehension. The bottle, however, is beautiful – classy and unassuming, and the bourbon itself almost glows a rich amber color. But, of course, looks can be deceiving. I pour a little in a snifter and ponder what I will do with the rest of the bottle if this stuff turns out wicked. Even though Russell’s Reserve 10 Year Small Batch Bourbon is only $30 a bottle, it would still be $30 wasted. “Maybe I can make bourbon balls with it”, I thought. My nose is met with the aroma of cinnamon toast and vanilla…this whiskey smells so luscious it could almost be turned into a scented candle. A few whiffs and my mouth is watering. A few swirls and then I sip. Relief washes over me….followed by waves of pleasure. “Wow”, “Oh man!”, “whew!” are my first descriptors. At first taste, there’s a little spice kick – but not enough to turn you off – followed by savory vanilla and caramel, molasses and a little oak. As it finishes on my palate, I am met with the taste of dried fruits – maybe raisin? – and some wood residuals. The texture of the bourbon is very light, requiring me to take several sips before I am able to pin down the full panorama of flavors. Drinking Russell’s Reserve 10 Year Old is pure pleasure. Its smooth as hell and almost elusive in its texture. This was better than a good buy – at $30 a bottle its priced just right. At 90 proof, its perfect for a neat pour. And with its sweet and spicy flavor profile, its a great bourbon to enjoy during the fall. I give this bourbon a B+. Learn how we grade our bourbons. Would I buy this again? Hell yes. Want to leave your own review? Please do! Click the button below and let us know what you think of Russell’s Reserve! When you try it, let us know what you think and whether or not we were spot on! New to bourbons. Just tried this one and I like it. It is sweeter and more flavorful than others I have tried. Other reviewers have said that they prefer WT101 to this one, for value if not for taste as well. How would you compare the two? To the eye: deep gold approaching the fringe of amber. On the nose: spice, gently charred wood, & tobacco. On the palate: body is medium oil/viscosity with prominent notes of vanilla, spice, chocolate orange and leather. Long finish with transient refrains of maple, honey, smoke and spice.